The house this blog has been reporting on has suffered delays in part because of two other projects. 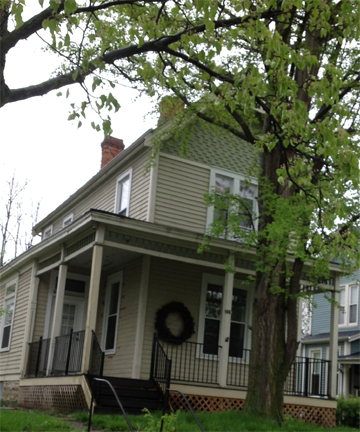 One, is a Victorian house that needed lots of fine tuning. 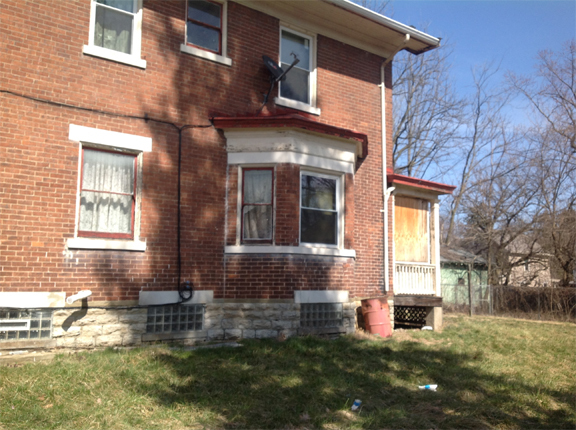 Below are the before and after photos of the outside of the house. Notice the tangerine door. 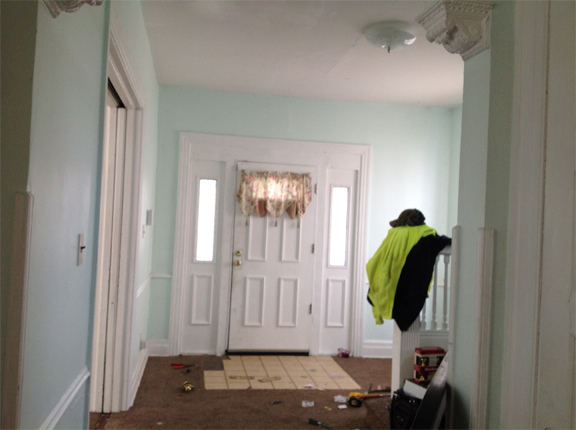 The interior of the door is painted the same color, really brightening up the hallway. The same color was toned down a bit for the dining room. Categories: Property Management | Permalink. 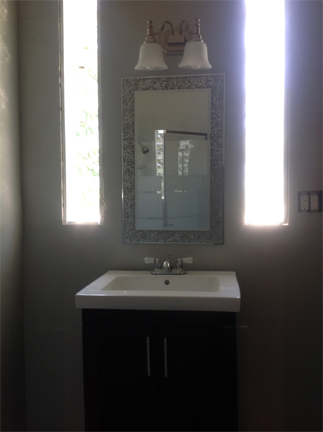 Black, white, gray and silver makes this an elegant bathroom. 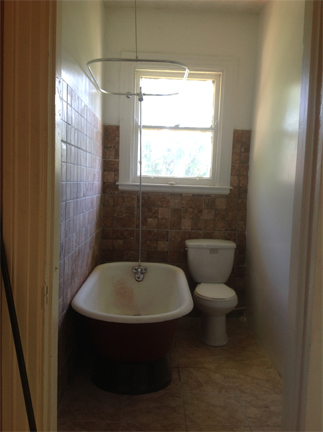 The area was small but the corner shower helped to give it some breathing space. Instead of windows, we elected to put elongated glass block strips, giving it light and privacy. 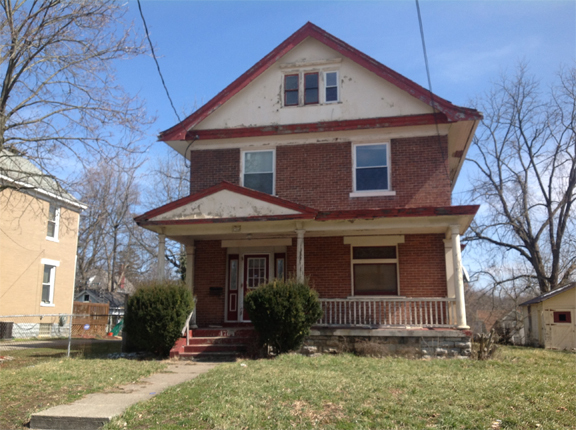 Categories: Property Management, Uncategorized | Tags: Bathroom, bathrooms, corner shower, Home & Garden, Madisonville Ohio, rehabbing old homes, Shopping, Shower, Sink, Tile, Toilet, Towel | Permalink. 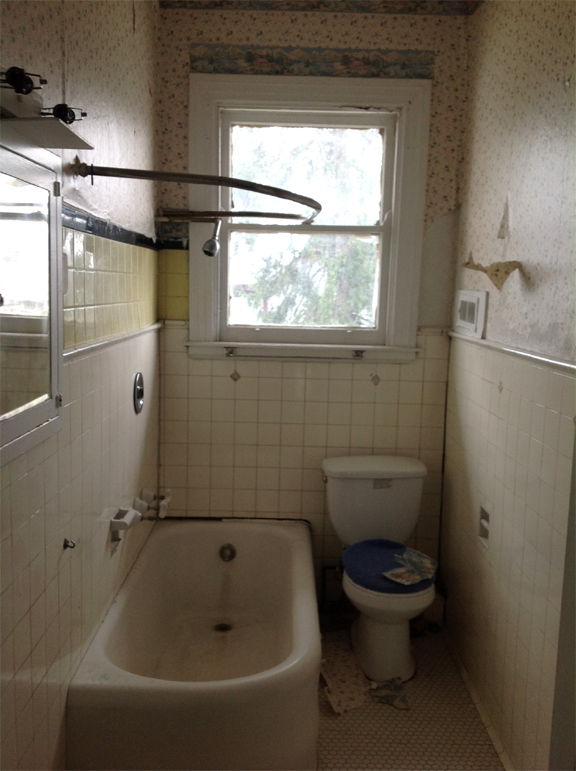 Categories: Property Management, Uncategorized | Tags: Madisonville house, pedestal bathtub, remodeling, TurnipTimes.com | Permalink. For those of you who love to watch the transformation of old houses morphing into livable homes, I thought you might enjoy watching the progress of this endeavor. The house is in Madisonville, a picturesque section of Cincinnati where people paint their houses similar to the ones in Cape May. 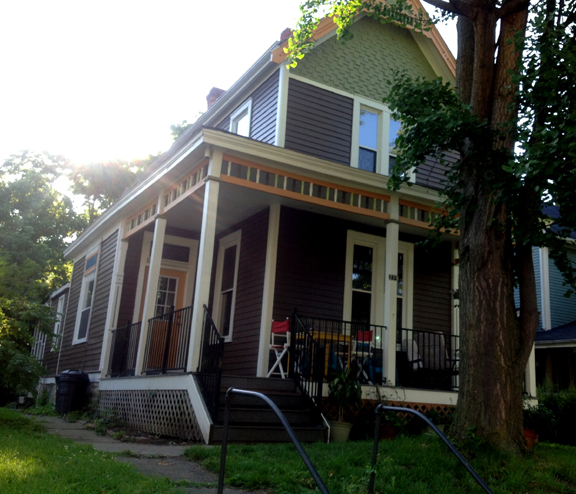 Any suggestions on what bright colors we should paint the non-brick section of this house? I am thinking of dark green and lavender. The roof over the porch must be shot because water pours through the rotted ceiling of the porch. The house at one time had a large back porch. Half of it was used to create a pantry and the other part was boarded up. It was being used to store junk. Below is the Dining room and the view from the window in the door leading to that porch is of the plywood covering the porch wall instead of a window or screen. 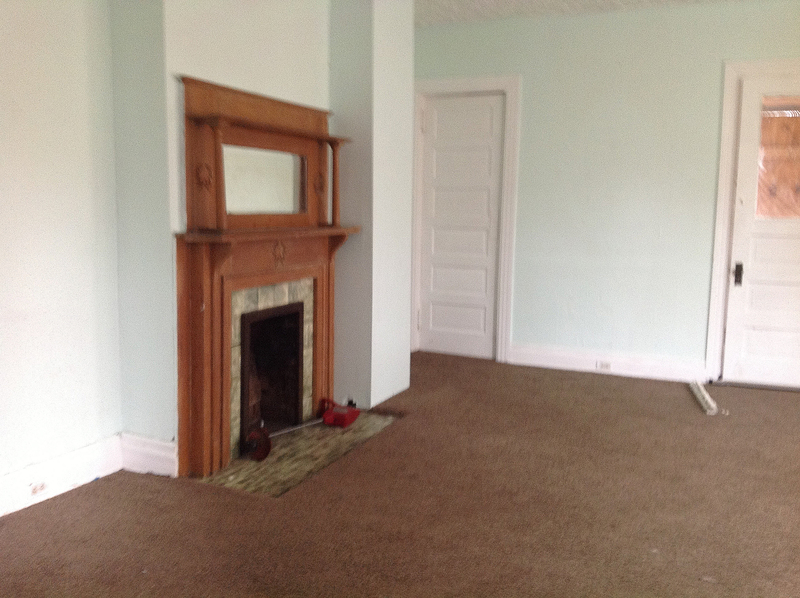 Notice the fireplace. I believe that the tile is from Rookwood, a famous pottery and tile company whose work is featured in the Cincinnati Art Museum. Some windows were replaced but many were not. The original wooden windows are pretty but you can feel the air coming in as though there was no window. Whatever windows were not replaced will be, except for two stained glass windows, one is in the front of the house and can be seen from the inside towards the right. The refrigerator, which takes up way too much space in the kitchen, will be moved into the pantry. The stove may have to be replaced as we heard a loud pop when we turned it on and the circuit breaker went. 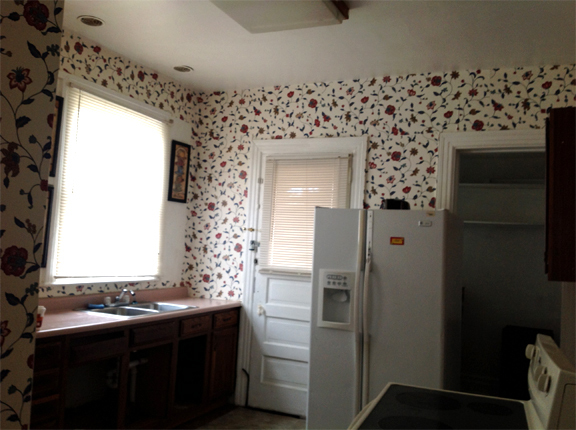 To keep the wallpaper or to not keep the wallpaper – that is a mystery. Who knows what lurks behind its cheerful countenance. The cabinets were once good but doors are missing on all the cabinets beneath the sink and some of the cabinets are on the floor. A tile floor will sure perk up this kitchen as will light colored cabinets. Some of the tiles are missing from the entry way. The bright green clothing belongs to Gary, who is heading up this project. I closed on the house on Monday. On Tuesday Gary changed the lock (there was no deadbolt lock on the front door), and fixed the front screen door. The back door is nailed shut but will soon also have a deadbolt lock. The screen door, was slamming open and closed as though it was part of a haunted house. I am sure the neighbors will not miss ghostly clamor. I measured for blinds which I will have installed fairly quickly so no one will be able to look inside. There is a distinct smell of cat odor. Lots of work will be needed to get those rugs clean and the carpet in the reception area will have to be changed as it has a weird spot on it that will most likely not come out. Tiles are missing. We found the right color match in Restore but they were the wrong size!! Second day I had a window replacement man come out and new windows will go in April 8th. 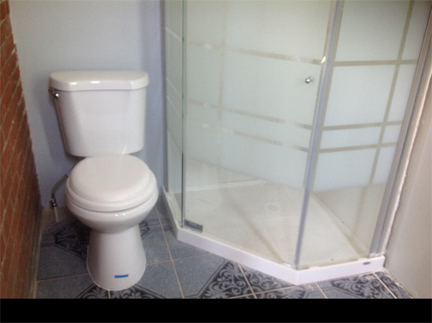 This large (almost 2500 square foot house) has ONLY one bathroom. And it is UGLY. The bathroom will be a top to bottom job. The bedrooms are nothing special so I won’t post them. They are square rooms, each with a small closet and two large windows. Two are painted bright, bright blue; one light blue; and the last pink. They will definitely have a face lift. 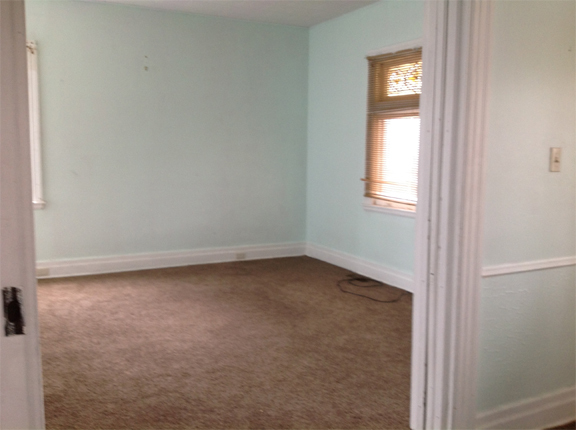 There is also a large attic which would be a great office or playroom. 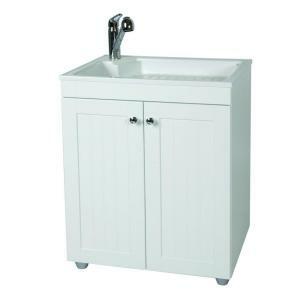 In the basement is a laundry room with a toilet. Someone can actually go into the bathroom and close the door. The last house I did has a stand alone toilet against the wall in the center of the basement between the stairs and the garage. In an emergency one can use the toilet and pray that no one comes down the steps or through the garage. Fun, fun, fun. and Gary will put in a vinyl floor. Sunday is roof day! Can’t wait to hear what the roofer finds. 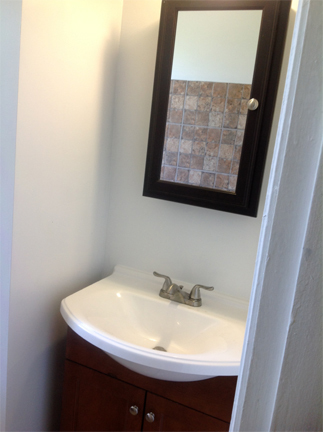 Categories: Property Management | Tags: bathrooms, Cincinnati, Madisonville, rehabbing old house, renovation | Permalink.